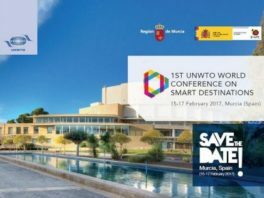 To advance and shape a tourism model for the 21st century based on innovation, technology, sustainability and accessibility – these are the aims of the World Conference on Smart Destinations to be held in Murcia on 15-17 February, organized by the World Tourism Organization (UNWTO), the Ministry of Energy, Tourism and Digital Agenda of Spain, and the Region of Murcia. A few weeks following the launch of the International Year of Sustainable Tourism for Development, the city of Murcia has picked up the baton to offer a platform for the discussion of key issues in the global agenda of the sector, such as innovation, technology, sustainability and accessibility. “These themes, which are priorities of the work of the World Tourism Organization, define 21st century tourism: committed to ecosystems, local cultures and to economic and social development,” explained UNWTO Secretary-General Taleb Rifai. “It will be impossible to capitalize on the potential of tourism in aspects such as job creation and socio-economic development if we do not commit to and move towards sustainable practices that are respectful of the environment and local communities,” he underlined.